Many aspirants are eagerly waiting for Cognizant Off Campus 2018 drive. If you are one among them then you are at right place to get all the information in a detailed manner. All the necessary support for the job seeking aspirants will be provided by us. The most important thing which you have to do is check the Cognizant Off Campus specifications like eligibility criteria, selection process, salary etc. To make the application process simple, we have provided a registration link which candidates can apply online for Cognizant Off Campus drive 2018. Cognizant is hiring candidates from all over India by organizing off campus drives at various colleges. This is an excellent opportunity for candidates to get a job in Cognizant. By accessing the complete information provided in this article applicants can aware of the Job Roles, Selection Process, Pay details etc. Those candidates seeing themselves in Cognizant Off Campus 2018 Drive were requested to go through the complete article. Cognizant company is organizing campus drives at different locations in order to select capable aspirant for the available vacancy. It is mandatory to all the participants gets qualified in the written test and Interview to win the competition. Applicants will be selected on the basis of their performance at the rounds of selection and suggest candidates be careful at the time of participating in the selection process. For helping the aspirants in their preparation we equipped some Cognizant Placement Papers and Cognizant Interview Questions. In addition to this check Cognizant Syllabus and Cognizant Test Pattern can be viewed from our site www.allindiajobs.in. The below given Cognizant Off Campus table is helpful for the visitors to come aware of all the information provided in this article within a short period of time. Applicant must maintain a minimum of 60% in their academics. Candidates should have consistent academic track records over the previous years. Before applying for Cognizant Off Campus drive aspirants have to make sure that there should be no pending backlogs at the time of applying for Cognizant Off Campus. In case having any backlogs, they were not eligible to apply. Cognizant Company will perform the selection process as per their requirement. Each and every level is important to go for the further round. 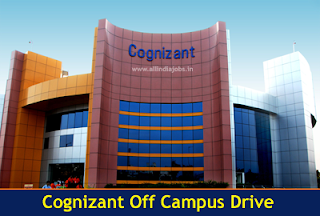 Candidates can apply for Cognizant Off Campus drive as fresher. Fresher applicants can expect the salary to be in between 3 – 3.5 Lakhs per Annum. Check the following instructions as they are helpful for the candidates to crack Cognizant Off Campus Drive. With proper preparation, you can easily get qualified over the rounds of selection in Cognizant Off Camus Drive. For freshers, this is a golden opportunity for applying and building up their career. Check Latest Cognizant Syllabus and Cognizant Test Pattern. Practice Verbal and written communication skills. Hope the information provided was helpful for all the job hunters while seeking their career as freshers. All the best for the applicants for their bright future. For Cognizant Off Campus and latest job opportunities in current market visit our site All India Jobs. Bookmark us so that you can visit us frequently. Thank You. I want to know about the date and venue of the off campus drive.. I want to know the date of the drive and the venue for the same. Please do inform us. I received an email from CTS but in the email no venue is mentioned. Anywhere . I am interested ..please share the date and venue details..